Country Event : Amman Jordan! Please join us for our second Continuing Education opportunity being held in Amman Jordan. Join us for a continuing education course where we will discuss “Opportunities for sustainable urban landscapes: Urban Infill and livable streets”. 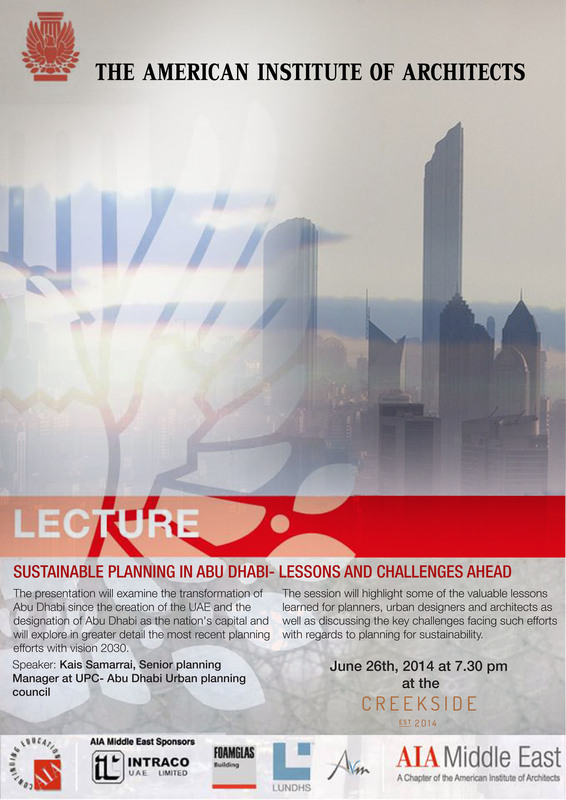 Join Dr. Anne Gharaibeh, a founder and head of the architecture department in Yarmouk University. Dr. Gharaibeh will discuss the use of urban infill ideas to create more livable neighborhoods through collecting water in vacant lands with interactive places and walkable streets. This vision is foreseen to improve urban qualities and landscape in semi-arid cities. AIA Middle East is proud to bring to you the completion of “Sustainable Design Solutions” program, AIA Middle East wishes to thank our partners for their support in making this lectures possible. Jebel Al Weibdeh, Al Baouneyya St, Amman. 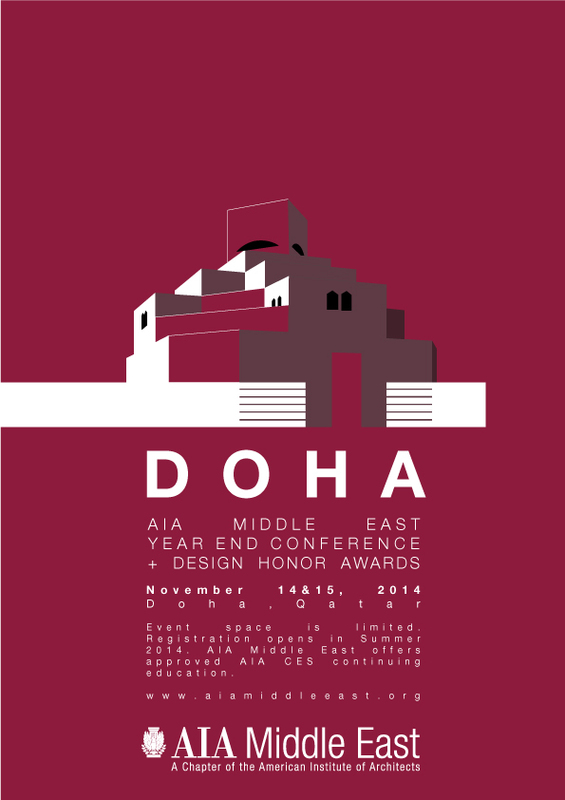 AIA Middle East is pleased to announce our second annual conference and Design Honor Awards Program! 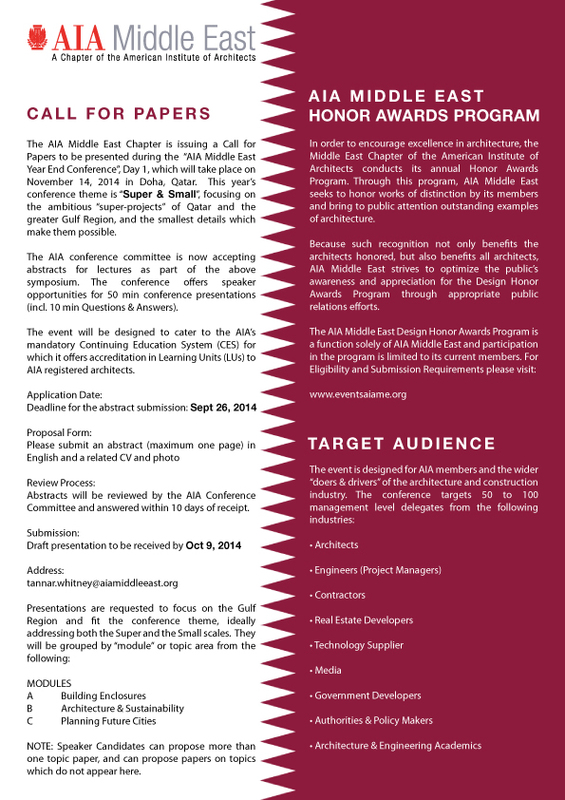 Below is our call for papers as well as the announcement of our annual design awards program; a standard in the GCC design industry. We look forward to welcoming you to the conference and celebrating excellence in design through our awards program. For more details, please go to www.eventsaiame.org or click on the Conference tab above! 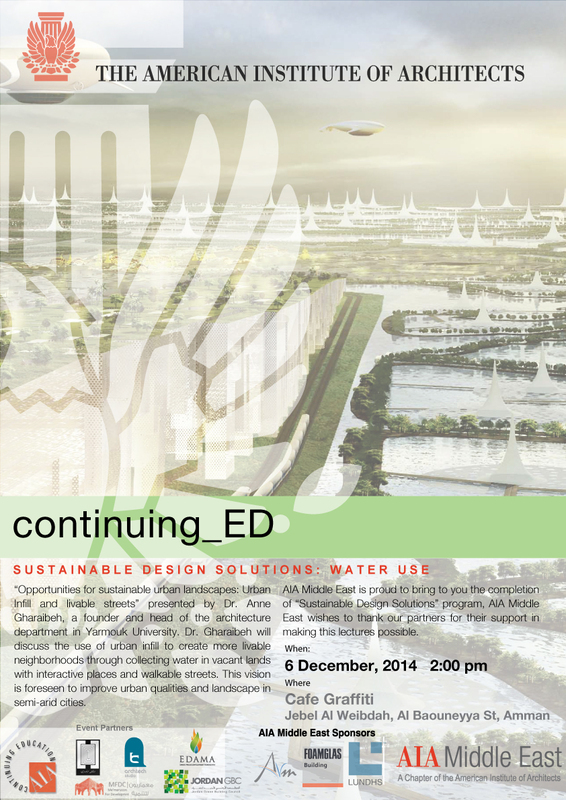 Presented by Huda Shaka, MIEMA, Cenv, Sustainability and Environment Team Leader at Arup Middle East. Space is limited so RSVP soon! 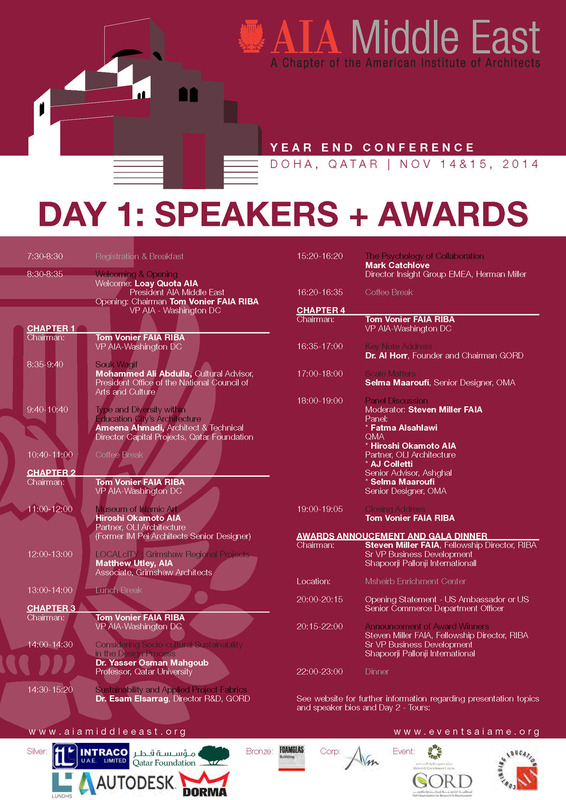 Thank you for your support of AIA Middle East - we hope to see you at the event! We at AIA Middle East are proud to announce that after a short FOUR YEARS in operation, we have grown to become the largest of the International Chapters. We wish to thank all of you who have supported us, particularly our sponsors, members and chapter officers who have worked tirelessly to acheive this incredible milestone! Former AIA Middle East President Thierry Paret, FAIA became the first member from the Middle East Chapter to be elevated to the American Institute of Architects College of Fellows during the 2014 National Convention held in Chicago on June 27th. Mr. Paret was presented with his medal by AIA President, Helene Dreiling, FAIA and the Chancellor of the College of Fellows William J. Stanley III, FAIA. Thierry was also the only fellow to be elevated from the AIA International Region this year. Founded in 1952, the College of Fellows is composed of members of the Institute who are elected to Fellowship by a jury of their peers. Fellowship is one of the highest honors the AIA can bestow upon a member. Elevation to fellowship not only recognizes the achievements of the architect as an individual, but also elevates before the public and the profession those architects who have made significant contributions to architecture and society. Out of a total membership of 84,000 approximately 3000 members are fellows. Thierry was the only new fellow from the AIA International Region to be elevated in 2014. 2014 AIA Middle East Chapter President Loay Quota, AIA and AIA Middle East Chapter Fellowship Director Steven Miller, FAIA attended the two hour long ceremony. The investiture ceremony was held in Chicago’s historic Roosevelt Theatre designed by Louis Sullivan and Dankmar Adler in 1888. 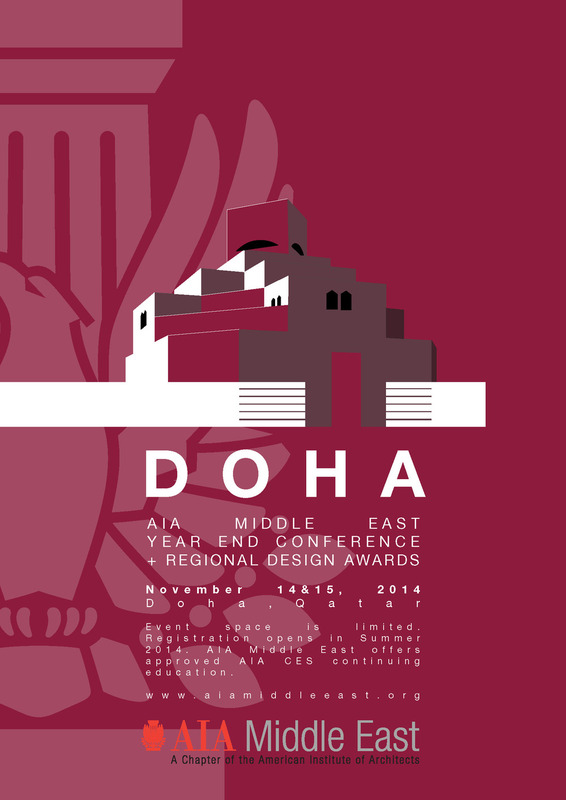 We look forward to welcoming you to the conference and celebrating excellence in design through our awards program. For more details, please go to www.eventsaiame.org! The American Institute of Architects and the International Trade Administration are happy to announce another opportunity to expand prospects for architects overseas with a trade mission to Doha, Qatar from November 17-19, 2014, with an optional mission stop in Riyadh, Saudi Arabia. The purpose of this mission is to introduce U.S. firms to the expanding and diversifying Qatari and Saudi markets. Both countries continue to develop new infrastructure projects as they broaden their economic scopes. The mission will focus on opportunities for U.S. exporters in master planning (city or regional planning, and port redevelopment); hospitals and healthcare architecture; hospitality; airports and other transportation facilities; mixed-use projects; sports and entertainment; and educational facilities. In Doha, mission participants will have market briefings with the Commercial Service and industry experts, networking opportunities with local industry experts, business-to-business meetings, site visits, meetings with government officials, and more. The optional stop in Riyadh from November 15-17 will include business-to-business meetings, market briefings, and site visits. The participation fee for the trade mission to Qatar is $2900 for small or medium-sized enterprises and $3,000 for large. The fee for each additional representative is $750. The additional participation fee for the Saudi Arabia optional stop is $2000 for small or medium-sized enterprises and an additional $2600 for large firms. The fee for each additional representative to add on the Saudi Arabia optional stop is $350. For more information, please refer to the mission statement found here. Recruitment for this mission will begin immediately and conclude no later than September 15, 2014. For an application and other information, please visit export.gov or contact Arica Young, U.S. Commercial Service, at arica.young@trade.gov or 202-482-6219. Further questions about the AIA’s involvement in trade missions should be directed to Derek Washam, the AIA’s Manager of Federal & International Programs, at 202-626-7595 or derekwasham@aia.org. This article was developed from a presentation made by Ajay Bhojwani, deputy managing director MCI Middle East at the CESSE Annual Meeting in 2013. In 2001, advanced economies dominated the world economy, contributing around two-thirds of global GDP. The expectation is that much of the future global output will be produced in the emerging world. The pace of this shift is a testament to the growth of these countries. Thanks to globalization virtually all developing countries are catching up. Since 2001, emerging markets have become the world’s economic engine with annual GDP growing an average of 6 percent and a rapidly growing consumer class, driving corporations to compete for market share. More than 1,000 companies headquartered in emerging markets have reached at least $1billion in sales annually demonstrating that robust private sectors made up of indigenous businesses are taking root. For US associations, finding ways to build and grow chapters and components in emerging markets will play an important role in defining locally relevant member value. This article takes a look at how one emerging market region – the Middle East (specifically the countries of the Gulf Cooperation Council) – is experiencing growth and how some associations are benefiting from this growth using chapters to build and sustain a vibrant presence. Two video case studies from Middle East chapter leaders from the American Society for Quality and Project Management Institute offer insights into building the right local chapter strategies for growth in emerging markets. Despite the political unrest in some Middle East countries, the countries of the Gulf Cooperation Council (GCC) continue to be amongst the fastest growing economies of the world as well as safe for business. Each of them is moving at a rapid pace to achieve the strategic objectives set by them in their vision for the next 10 – 15 years. Over 177 million people live and work in GCC countries (median age of only 25 years) which include: Bahrain, Kuwait, Oman, Qatar, Saudi Arabia, and the United Arab Emirates. It is known for its oil and gas industry wealth which represents 44% of the world’s crude oil reserves. But it may be less well known that these countries are in the top 50 countries listed in the World Bank’s Doing Business Index which measures the ease in which businesses can operate around the world. Utilities and transport: Governments will continue to support and invest in sectors that cater to their growing population, including power, water, electricity and transport. In Qatar, General Electricity and Water Corporation is considering expanding its power network that will cost $18 billion in the next seven years. About 45 percent of the Dubai budget has been earmarked for infrastructure and public transport, with beneficiaries being the Road and Transport Authorities, Dubai Metro, Dubai Municipality projects and Dubai Ports Authority. Financial services: Will continue to be a major contributor to the region’s economy, as it aspires to become a regional hub and will represent significant growth area. Industrial and manufacturing: In the UAE, the sector grew by 40 percent within the past four years with the investment volume more than doubling. A recent statement by the UAE Minister of Economy reflected UAE’s ambition to become the preferred destination for investments in high-tech and heavy industries for global investors. Health care and education: There is significant need for investments in these areas, considered still underdeveloped to serve a growing young population. Projects contributing to ensuring access, quality and capacity building are given priority. Working in a multicultural environment, Dubai has a diverse work force with a number of corporations who are located here as regional hubs. So the work environment tends to provide enormous opportunities to learn and adapt to various cultures. The city is as busy and buzzing as New York, USA or Mumbai, India. Men should not offer handshakes to ladies, unless offered a hand by them. One needs to be patient when dealing on a local level and a lot of times contracts are established and work is done by handshakes and verbal confirmation without having anything in writing. Work hours depend on industries and can be long at times. Friday is a weekend, however being a work day in other parts of the world depending on the industry one needs to be available for work queries. What are the absolute Do’s and Don’ts when doing business? Many associations experience barriers to making their volunteer leader system work in emerging market countries for a variety of reasons. In the MENA region and specifically for GCC countries you should be aware of the following issues so that alternative approaches can be implemented to take advantage of the local strength and capabilities of local leaders. Volunteerism: what’s in it for me? – You must be prepared to adapt your standard methods in emerging markets as local leaders with the means to organize and rally locals often come forward to give to the industry unless there is personal gain and something that answers what’s in it for them. City / State and National / Regional Boundaries – Care must be taken to choose chapter territories correctly. Associations sometimes cover too large a geographic area which makes it more complicated for these chapters to operate and govern. Governance – Democratic or King’s Rule – Quite a few markets are under a king’s rule or under specific government policies, which impacts memberships of associations. In lot of cases these memberships are compulsory, which is why there is no drive by associations or its volunteers to make it work. Local Vs Expat Members – This is for Middle East specific – too many expat members who sometimes do not have any interest in developing the profession in that country. So it becomes a challenge to have the right mix of local and expat members aligned with the services locals might want or need. The following video case studies that follow should offer further insights into how building a healthy chapter can be managed. In this interview with Mr. Sunil Thawani, ASQ Country Counselor – UAE & Global Committee Member, Past Chairman, Continual Improvement Group, Dubai Quality Group, we learn about the chapter’s history & current operation, comments on legal framework/regulation, challenges faced, opportunities in the region, and the role of Association HQ to support the chapter. In this interview with Mr. Reyadh Ayesh, CEO, Smart World (a joint venture of Etisalat & Dubai World Central) and the President and co-founder of UAE Chapter – Project Management Institute, we learn about how the chapter was formed, its structure and activities, the challenges faced and recommendations for international associations. Flexibility around chapter formation and structure – be prepared to deal with different laws and regulations as well as market sizes. One needs to be flexible around chapter regulations and bylaws. Local Activity Support – Support for key chapter activities is often crucial to help grow the chapter with speed to reach its potential which could come from HQ or preferably a local source. Local / Regional Marketing Outreach – Have this in place as the brands for many associations are not strong when going into new markets and you must activate demand based on local relevance to your selected products and membership. Administrative Assistance – The higher the management positions of local volunteers in emerging markets the greater the need for admin assistance or else they fail to achieve their objectives. Is Your Value Proposition Relevant – the need for making your membership benefits locally relevant. A lot of US association benefits are not adjusted to local needs and often have less relevance for international members which is why they do not feel the need to keep their membership going. As MCI's Senior Advisor, Global Development Strategy, I help associations build and execute global growth strategies. Over the past 30 years I have served three associations (ASAE, MPI and IEEE Computer Society) as a leader of business, product and partnership development. 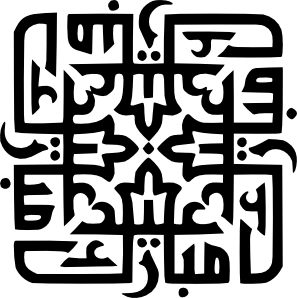 On behalf of all of us at AIA Middle East we wish you and your loved ones happiness, good health and prosperity. 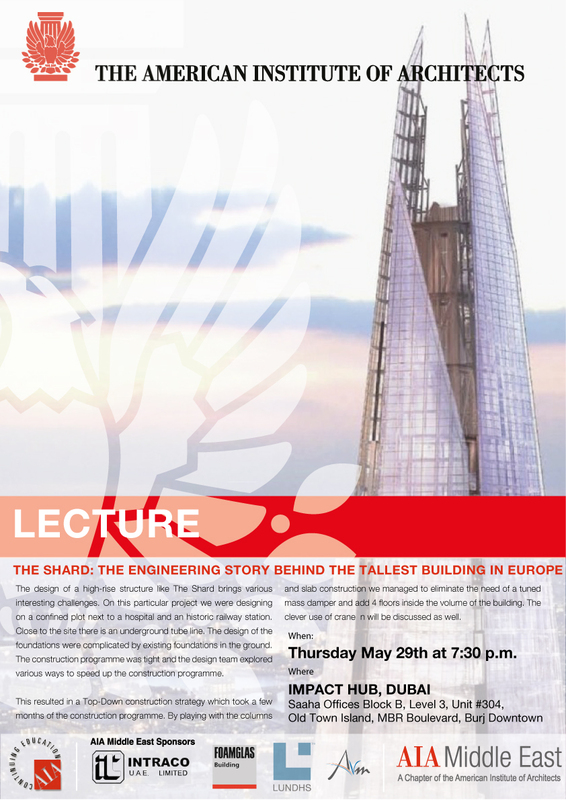 The design of a high-rise structure like The Shard brings various interesting challenges. 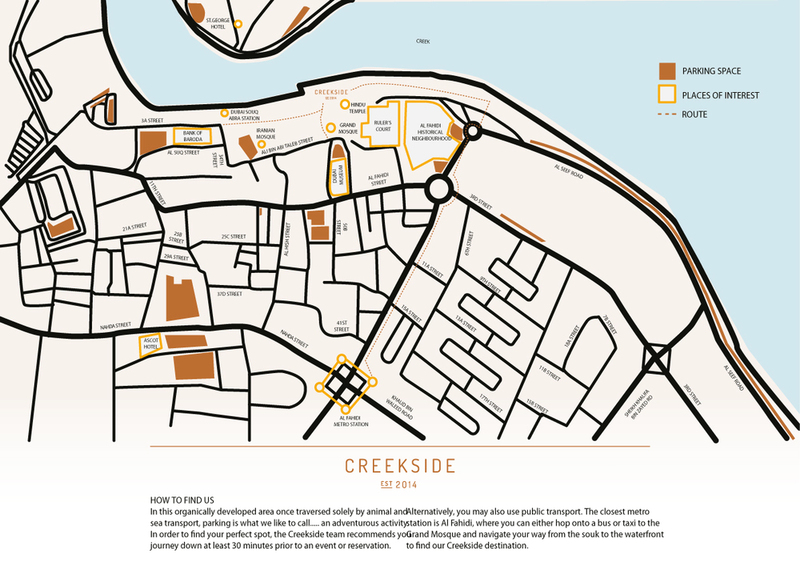 On this particular project we were designing on a confined plot next to a hospital and an historic railway station. Close to the site there is an underground tube line. The design of the foundations were complicated by existing foundations in the ground. The construction schedule was tight and the design team explored various ways to speed up the construction schedule. This resulted in a Top-Down construction strategy which took a few months of the construction schedule. By playing with the columns and slab construction we managed to eliminate the need of a tuned mass damper and add 4 floors inside the volume of the building. The clever use of cranes during construction will be discussed as well. This course has been registered for Continuing Education! Construction Tour: Historic Atturaif Site. Atturaif, a precinct on Historic Diriyah, was inscribed on the Unesco World Heritage List in 2010. Large scale conservation and restoration of historic mud buildings and a program of modern museums within the site will transform the site into a cultural destination. Join us on a tour of the site to learn about the ongoing work and progress to date. Date: Saturday, May 10, 2:00-4:00pm. Please RSVP: Space is limited. 2 Continuing Education Units will be provided. Location of meeting and other particulars will be confirmed to those who RSVP. AA Visiting School Jordan is a ten-day workshop organized by the world-renown Architectural Association, London - set within the context of Amman, Petra and Wadi Rum. The workshop brings together network of distinguished international faculty who will instruct participants on the cutting-edge of design methodologies in the Architecture, Engineering and Design disciplines today. The workshop will focus on the potential embodied within the natural morphologies within the landscapes of South Jordan; rethinking current design practices and informing new design-research ideas. The workshop also includes a series of events including guest lectures, panel discussions and open reviews. Confirmed speakers include world-renown designer Ross Lovegrove who will lecture from the Wadi Rum Desert, in addition to Wael Attili of Kharabeesh, and Julia Koerner of UCLA. Participants of the workshop will also receive a certificate from the Architectural Association, London. Dubai will be hosting Smart Skyscrapers Summit 2014 on 28 & 29 April 2014 at Sofitel Dubai The Palm Resort & Spa attracting over 300 senior architects, engineers, policy-makers, developers, contractors and building managers from across the GCC region. The conference will see presentations and case studies from local and international thought-leaders, a showcase of the most innovative building technologies and solutions from around the world. Following 5.9% growth in the sector year on year and real estate’s contribution to overall GDP climbing 4.6% in the same period, Cityscape Egypt 2014 will be the largest in its history withmore than 100 exhibitors and over 100,000 showcased properties. Key exhibitors at the fifth edition of the flagship event include Abraj Misr, Al Ahly Real Estate Development, Palm Hills Developments, SODIC, Rooya Group, Al Morshedi Group, Amer Group, Cairo Festival City, Emaar Misr for Development, Hassan Allam Properties, Maxim For Real Estate, Arabia Group, New Giza and Talaat Mostafa Group. 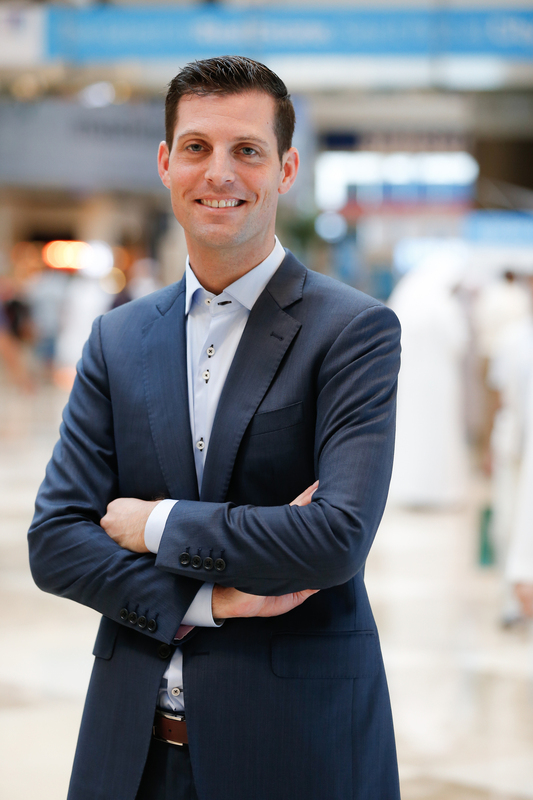 Director of Cityscape Group, Mr. Wouter Molman revealed that increased demand for exhibition space has resulted in a sell-out event, with halls booked out weeks ahead of its opening on 9-12 April at the Cairo International Convention & Exhibition Centre (CICC). Visitor numbers are expected to match the continued growth of the exhibition, totaling more than 12,000 in 2013. Cityscape Egypt 2014 is taking place at a time when Interim government is exerting tremendous effort to boost the real estate market. Key strides include mortgage law amendments and real estate fund legislative changes designed to ease investment hurdles and support overall real estate market growth in the coming period”, added Molman. Further improvements to the mortgage market include this week’s announcement by Central bank of Egypt to allocate EGP 10 billion funding to affordable housing units. Over a 20-year period, banks will acquire money from the Central bank at below market interest rates and re-lend to low earners at a 7% decreasing rate of return. The announcement comes just days after the government inked a landmark deal to build 1 million affordable homes across Egypt with UAE construction company Arabtec Holding. Financial flexibility is being reported alongside a number of other positive announcements including Al-Futtaim Group’s $2.2 billion worth of new developments, TalaatMoustafa's 7.2 percent increase in net profit (in 2013) and significant levels of new supply entering the retail and residential markets. Dr. Mohamed El Mikawi, Managing Director of Al Futtaim Group Real Estate explained “Cityscape provides unparalleled opportunities that can help revive the sector. Having such a wide-range of properties to suit all tastes under one roof enables developers to get more insight into customers’ preferences.” Mikawi added that his company is planning to exhibit the second phase of its “Cairo Festival City” (CFC) mixed used project. “Cityscape brings better exposure to real estate products, positioning developers among competitors and providing an opportunity to meet customers directly” agreed Abdel Nasser Taha, Development Director Mivida Emaar Misr. He addedthat the company is anticipating an increase in sales volume driven by Egypt’s population growth rate of 1.8% per year. “The event timing is commensurate with a potential sector rebound on the account of foreign Direct Investment inflows. Investors need events like Cityscape to form a clear vision of the current status of the market,” said Esam Hafez, Country Director at Retail Group Egypt. Tarek Abdel Rahman, Chief Investment Officer, Palm Hills Developments stated that Cityscape Egypt will contribute significantly to reinvigorating the real estate sector through boosting property sales volumes, and that Palm Hills Development (PHD) will be displaying around 18 projects this year. Egypt’s real estate market has long been a key pillar of the economy and a lucrative market for investors seeking immediate income, medium to long term capital growth and a good resale potential. Recent announcements affirm that Egypt is on track to accelerate its economic growth, sustained by the government continuous efforts and the increasing property demand and supply. The Change Initiative's flagship showroom on Sheikh Zayed Road is one of the most sustainable building in the world. 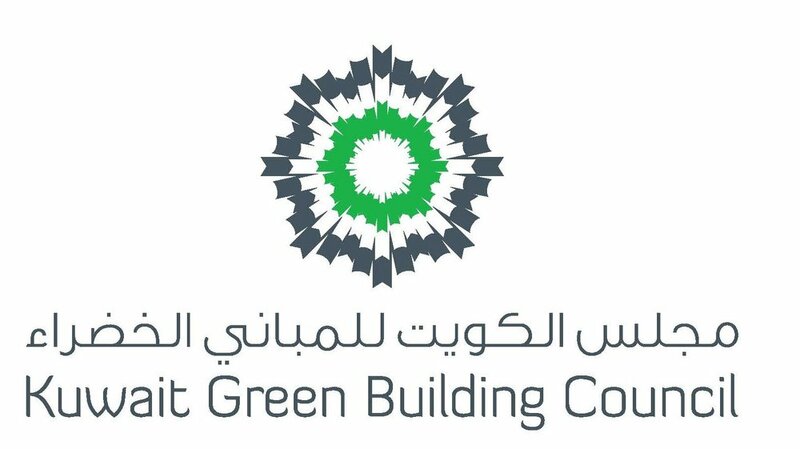 The LEED CI Platinum certification was awarded by the U.S. Green Building Council (USGBC) in 2013 having achieved a colossal 107 points out of a maximum of 110 on the LEED green building sustainability guidelines, the highest ever for the said rating system. In this 1 hour interactive sessions, participants will workshop the 7 principles of green building design under LEED CI; Sustainable Sites, Water Efficiency, Energy and Atmosphere, Materials and Resources, Indoor Environmental Quality, Innovation in Design, and Regional Priority. We will then discuss the challenges and opportunities that completing the certification presented. Lastly, participants will participate in a led building tour to explore the green building solutions that support the certification. From Abu Dhabi, Take Exit 36 / From Dubai Take the Mall of The Emirates exit into Al Barsha towards Sharaf DG Metro station. March 12, 2014, 6:30 p.m.
Technology is everywhere—be prepared to meet your clients’ growing needs and demands! Participants will be able to identify areas where technology impacts design and discuss such key areas such as value to the client, benefits of properly planned for and installed components, key elements, budgeting, best practices, and common misconceptions. Attendees will leave with an in-depth knowledge of the types of technologies that can be installed into residential projects and the proper infrastructure that is needed to support these complex systems, as well as being able to incorporate essential timelines needed for engaging an electronic systems professional in the design and build process. The Kingdom of Saudi Arabia's largest gathering for construction products and services returns from 9 - 12 March 2014. The Big 5 Saudi has doubled in size and attracted 10,006 visitors from 54 countries, a 10 % increasing from 2013. Some of the popular features returning in 2014 include the sell-out Concrete Repair Workshop, with already world-renowned experts, and the LEED Workshops on sustainable building concepts. Also returning is the Concrete Zone, which last year showcased over 60 international and Gulf exhibitors vast range of products from construction chemicals to block-making machinery. New to The Big 5 Saudi will be the dedicated PMV Zone dedicated to plant, machinery and vehicles. This will include a wide spectrum of products from earth-moving equipment, truck mixers, tower cranes and lifting equipment. The Big 5 Saudi has been running the prestigious Platinum Club. This invite-only group brings together key contractors from around the globe. 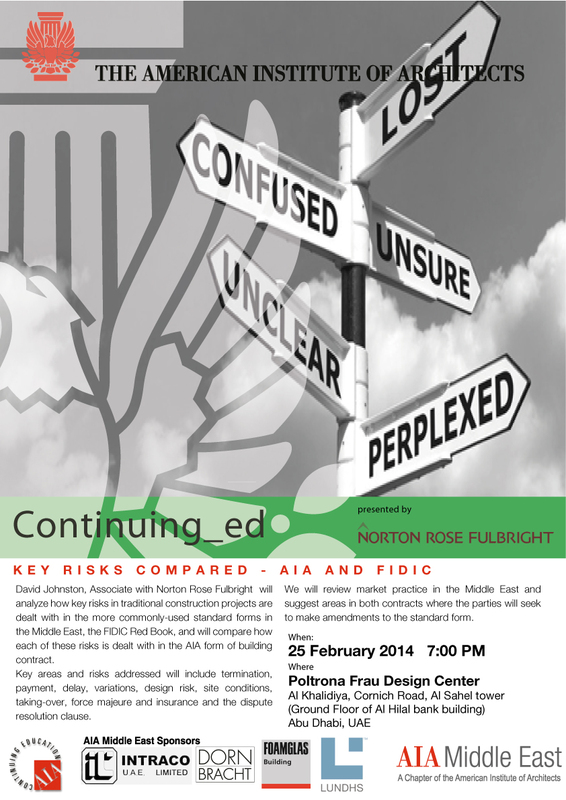 The seminar will analyze how key risks in traditional “build-only” construction projects are dealt with under one of the more commonly-used standard forms in the Middle East, the FIDIC Red Book, and will then go on to compare how each of these risks is dealt with in the AIA 102/201 form of building contract. The key areas and risks that the seminar will seek to address include termination, payment, delay, variations, design risk, site conditions, taking-over, force majeure and insurance. The seminar will also cover the dispute resolution clause the bond/guarantee package. The seminar will also discuss market practice in the Middle East and suggest areas in both contracts where the parties will seek to make amendments to the standard form. The Poltrona Frau Design Center- Abu Dhabi Address: Al khalidiya area, Corniche road, Al Sahel tower (same building as Al Hilal bank) on the ground floor.